Don’t see the Generate Settings? It’s new to Page Generator Pro 1.9.7 and higher. Ensure that your license is valid, not expired and that you’ve updated to the latest version of the Plugin. 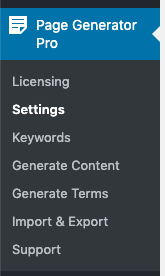 The Generate Settings provides options for specifying the default behaviour when Generating Content and Terms, using the Generate: Run functionality. Stop on Error: Whether to stop Content / Term Generation when an error occurs. Use Performance Addon: If enabled, uses the Page Generator Pro: Performance Addon Must-Use Plugin. This can improve generation times and reduce memory usage on sites with several Plugins.